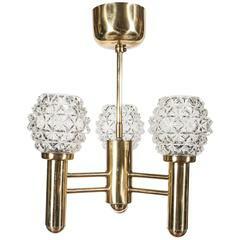 Beautiful vintage 1960s Italian 10 armed chandelier in brass and with opaline glass globe shades. 5 long 5 short arms. This gorgeous Italian chandelier has been totally refurbished with new wiring and with E15 bulb holders. A Classic design that will grace any home and never go out of fashion. A pair of vintage Ifö of Sweden ceramic bathroom lamps from the 1960s Opaline glass shades Ceramic bulb holders for an E15 bulb In great condition and ready to use. Vintage Danish table lamp in copper and with a glass opaline shade. Lovely patina to the surface of the copper. Rewired and ready to use. A pair of Italian designed modernised chandeliers in brass with opaline spiracles shades blackened metal caps style of Stilnovo. 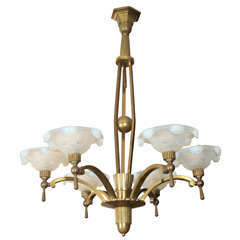 This chandelier features six original waterfall opaline glass shades. 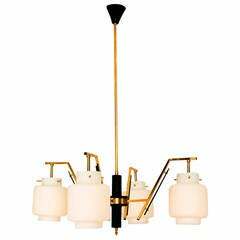 The antique brass fixture combines and modernistic frame with ornamental shades. 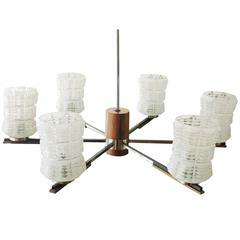 Circa 1960 Italian Mid-Century sputnik chandelier with chrome arms and rosewood accents. Each arm holds a frosted glass shade textured with clear cutouts.